One thing I noticed after upgrading my Macbook Pro 2010 model to OS X Lion is the startling drop in speed. Using Parallels Desktop to run Windows apps on Mac could be a reason, but overall the speed has reduced substantially from what I used to get in Snow Leopard. 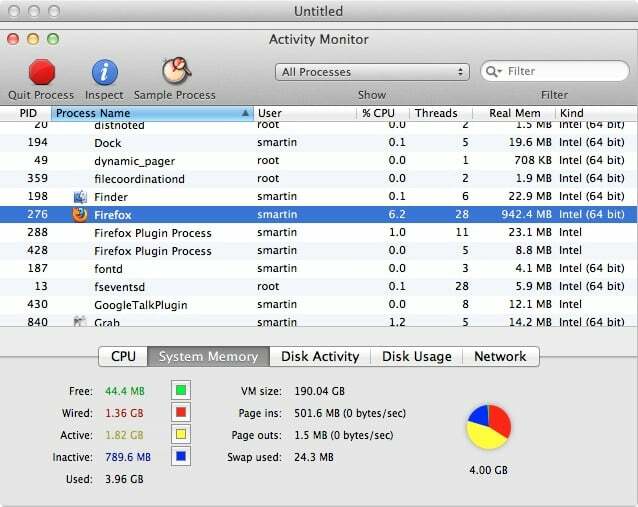 It is obvious-since there are a lot of new services and features in OS X Lion the exiting RAM and system resources would find it difficult to handle the load. Those who are using Lion in a scanty hardware configuration might have already spotted kernel panic messages, and performance lags while working with multiple applications. In Windows, you could get a system maintenance utility to fix speed issues-but in Mac, the choices are less. 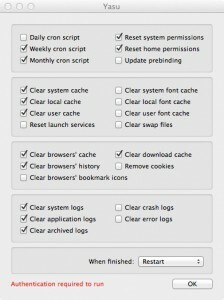 After testing various tools and internal settings of Mac OS X Lion, I’ve formed a quick guide-that would help you in speeding up the OS to some extend. Mac OS has ingrained tools to regulate its health by running intermittent scripts. These scripts run on daily, weekly and monthly schedules to pull off the system logs, debris, caches and other redundant items that would impinge upon system speed. Since these actions are carried out on a predefined time, it may not take place always. The system should be ON and working at the time of script execution, otherwise the garbage files will keep on accumulating. Yasu is a freeware Mac OS software (compatible with Lion) that let you initiate the system repair scripts manually. 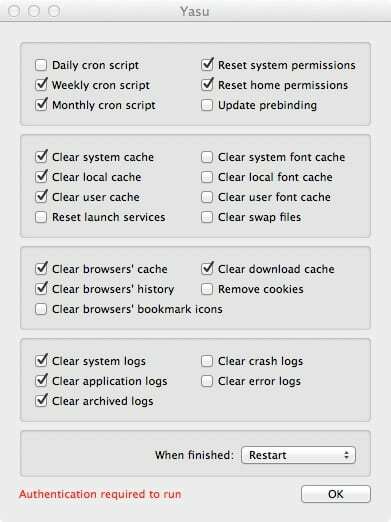 Apart from running the OS X scripts, it provides options to clear various types of caches, log files and history entries. Alterations will come into effect after a quick restart. 2. Exit background running apps in Lion: When you hit the close button on a Mac app-it just hides and keeps running in the background. This is to prevent the accidental loss of your data and to ensure that you save the modifications in open documents. However, when the system crashes or slows down to an unresponsive state, it becomes inevitable to quit some applications forcefully. You can launch the Force Quit window in Mac by using the Command+Option+Esc key combination. Then select the required app and press force quit button. All of sudden you will observe an upswing in speed. If you’re familiar with the common Macintosh processes introduced by system and applications, there is an advanced way for quitting apps using the Activity Monitor app. This app is located in the Utilities folder inside OS X Applications folder. It will itemize a set processes and child processes initiated by different applications and daemons. Select the required one and click on Quit Process option at the top left side. 3. Close unwanted program cycles: Check the image given above. 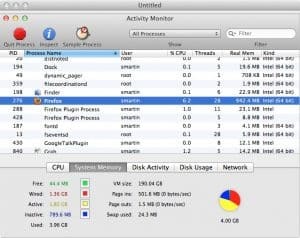 Here, the Firefox app for Mac is using around 1GB of RAM and 6% processor resources. This is because I’m using it with around 50 tabs and three windows open. So the point is simple-to speed up the OS, close those unwanted browser tabs and program windows that are not in use. 4. Disable Mac OS X services or daemons: Similar to that in Windows, Mac OS also has a set of services that links its hardware and software parts, and they are called Daemons. These Daemons launch various processes and expedite a smooth operation of applications. Nearly all services are essential for functioning of the OS, then there are some, which are not much useful but drains a share of resources. Lingon is a freeware (advanced version in available in Mac app store) Mac OS software that allows you check Mac OS X services and disable the undesired. It will populate the list of user generated and System Demons. Make sure that you get more details of a service before deactivating it using the edit an option in the software interface. 5. Adjust the visual effects and hidden settings: Download this app. It enables you customize some settings of the Mac OS X Lion operating system. Features like animations, effects can be turned ON/OFF-also it gives access to some hidden system features. Once the animations are turned OFF, the related process quits and ultimately results in a slight improvement in speed. 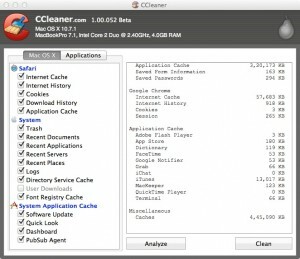 The Mac OS X Lion alternative of the well-liked Windows utility cCleaner is now available for download. 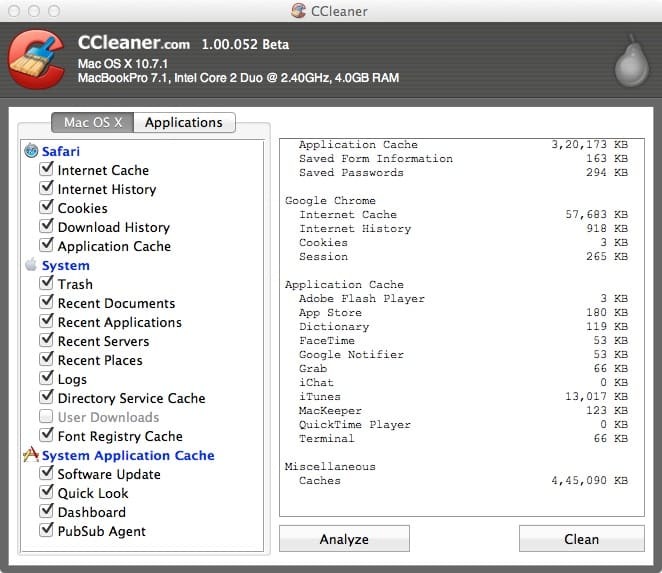 CCleaner for Mac is still in its beta stage but provide decent options. It can be used to clear the cache files generated by applications, OS X components, browser history items, saved passwords, cookies and software log files. Trying to speed your Mac/PC after purchasing a bad hardware? Well, go get a good processor, enough RAM and if possible an SSD. The issue with most of Macs are that we cannot upgrade the hardware* after purchase. So my advise is reserve a little more money when you customize your Mac from the Apple store. IMHO these software and tips may not help you recover the speed that would expect. I was facing drop in speed just after upgrading to OS X lion. I followed all above steps no doubt I feel bit improvement I think Ccleaner helped me a lot. Thanks for sharing this.. But today I magic happened one of my friend have given me a software called speedup Mac (link) This software actually did great job for me.